The Airvu 1.2GHz Low Pass Filter is placed on the end of the antenna port to help eliminate or reduce radio interference problems on UAVs. It does this in two ways 1. It reduces out of band noise entering the receiver that cause effects such as reduction of control range 2. 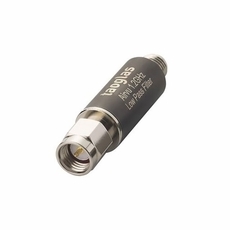 It reduces the antenna transmissions of out of band noise affecting other circuitry on your UAV (such as disrupting the GPS receiver leading to loss of fix, or a live video stream at 5.8GHz) The LPF.12.01 internal ceramic filter has better insertion loss and stop band performance than competing LTCC or lumped element filters, while also having good rejection at band edges. It uses a standard SMA(M) Plug to SMA(F) Jack interface. This filter is designed to be easily screwed onto this standard antenna SMA connector.